For the company, see Xylem Inc.
Xylem (blue) transports water and minerals from the roots upwards. Primary xylem is formed during primary growth from procambium. It includes protoxylem and metaxylem. Metaxylem develops after the protoxylem but before secondary xylem. Metaxylem has wider vessels and tracheids than protoxylem. Pressure flow hypothesis: Sugars produced in the leaves and other green tissues are kept in the phloem system, creating a solute pressure differential versus the xylem system carrying a far lower load of solutes- water and minerals. The phloem pressure can rise to several MPa, far higher than atmospheric pressure. Selective inter-connection between these systems allows this high solute concentration in the phloem to draw xylem fluid upwards by negative pressure. Transpirational pull: Similarly, the evaporation of water from the surfaces of mesophyll cells to the atmosphere also creates a negative pressure at the top of a plant. This causes millions of minute menisci to form in the mesophyll cell wall. The resulting surface tension causes a negative pressure or tension in the xylem that pulls the water from the roots and soil. Transpirational pull requires that the vessels transporting the water be very small in diameter; otherwise, cavitation would break the water column. And as water evaporates from leaves, more is drawn up through the plant to replace it. When the water pressure within the xylem reaches extreme levels due to low water input from the roots (if, for example, the soil is dry), then the gases come out of solution and form a bubble – an embolism forms, which will spread quickly to other adjacent cells, unless bordered pits are present (these have a plug-like structure called a torus, that seals off the opening between adjacent cells and stops the embolism from spreading). The cohesion-tension theory is a theory of intermolecular attraction that explains the process of water flow upwards (against the force of gravity) through the xylem of plants. It was proposed in 1894 by John Joly and Henry Horatio Dixon. Despite numerous objections, this is the most widely accepted theory for the transport of water through a plant's vascular system based on the classical research of Dixon-Joly (1894), Eugen Askenasy (1845–1903) (1895), and Dixon (1914,1924). 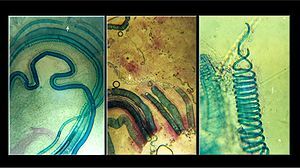 Xylem appeared early in the history of terrestrial plant life. Fossil plants with anatomically preserved xylem are known from the Silurian (more than 400 million years ago), and trace fossils resembling individual xylem cells may be found in earlier Ordovician rocks. The earliest true and recognizable xylem consists of tracheids with a helical-annular reinforcing layer added to the cell wall. This is the only type of xylem found in the earliest vascular plants, and this type of cell continues to be found in the protoxylem (first-formed xylem) of all living groups of vascular plants. Several groups of plants later developed pitted tracheid cells independently through convergent evolution. In living plants, pitted tracheids do not appear in development until the maturation of the metaxylem (following the protoxylem). In most plants, pitted tracheids function as the primary transport cells. The other type of vascular element, found in angiosperms, is the vessel element. Vessel elements are joined end to end to form vessels in which water flows unimpeded, as in a pipe. The presence of xylem vessels is considered to be one of the key innovations that led to the success of the angiosperms. However, the occurrence of vessel elements is not restricted to angiosperms, and they are absent in some archaic or "basal" lineages of the angiosperms: (e.g., Amborellaceae, Tetracentraceae, Trochodendraceae, and Winteraceae), and their secondary xylem is described by Arthur Cronquist as "primitively vesselless". Cronquist considered the vessels of Gnetum to be convergent with those of angiosperms. Whether the absence of vessels in basal angiosperms is a primitive condition is contested, the alternative hypothesis states that vessel elements originated in a precursor to the angiosperms and were subsequently lost. 2 acquisition) through the use of stomata. Specialized water transport tissues soon evolved in the form of hydroids, tracheids, then secondary xylem, followed by an endodermis and ultimately vessels. 2 was withdrawn from the atmosphere by plants, more water was lost in its capture, and more elegant transport mechanisms evolved. As water transport mechanisms, and waterproof cuticles, evolved, plants could survive without being continually covered by a film of water. This transition from poikilohydry to homoiohydry opened up new potential for colonization. Plants then needed a robust internal structure that held long narrow channels for transporting water from the soil to all the different parts of the above-soil plant, especially to the parts where photosynthesis occurred. 2 uptake. However, even in these "easy" early days, water was at a premium, and had to be transported to parts of the plant from the wet soil to avoid desiccation. This early water transport took advantage of the cohesion-tension mechanism inherent in water. Water has a tendency to diffuse to areas that are drier, and this process is accelerated when water can be wicked along a fabric with small spaces. In small passages, such as that between the plant cell walls (or in tracheids), a column of water behaves like rubber – when molecules evaporate from one end, they pull the molecules behind them along the channels. Therefore, transpiration alone provided the driving force for water transport in early plants. However, without dedicated transport vessels, the cohesion-tension mechanism cannot transport water more than about 2 cm, severely limiting the size of the earliest plants. This process demands a steady supply of water from one end, to maintain the chains; to avoid exhausting it, plants developed a waterproof cuticle. Early cuticle may not have had pores but did not cover the entire plant surface, so that gas exchange could continue. However, dehydration at times was inevitable; early plants cope with this by having a lot of water stored between their cell walls, and when it comes to it sticking out the tough times by putting life "on hold" until more water is supplied. While wider tracheids with robust walls make it possible to achieve higher water transport pressures, this increases the problem of cavitation. Cavitation occurs when a bubble of air forms within a vessel, breaking the bonds between chains of water molecules and preventing them from pulling more water up with their cohesive tension. A tracheid, once cavitated, cannot have its embolism removed and return to service (except in a few advanced angiosperms which have developed a mechanism of doing so). Therefore, it is well worth plants' while to avoid cavitation occurring. For this reason, pits in tracheid walls have very small diameters, to prevent air entering and allowing bubbles to nucleate. Freeze-thaw cycles are a major cause of cavitation. Damage to a tracheid's wall almost inevitably leads to air leaking in and cavitation, hence the importance of many tracheids working in parallel. 2 periods of the late Permian, in the horsetails, ferns and Selaginellales independently, and later appeared in the mid Cretaceous in angiosperms and gnetophytes. Vessels allow the same cross-sectional area of wood to transport around a hundred times more water than tracheids! This allowed plants to fill more of their stems with structural fibers, and also opened a new niche to vines, which could transport water without being as thick as the tree they grew on. Despite these advantages, tracheid-based wood is a lot lighter, thus cheaper to make, as vessels need to be much more reinforced to avoid cavitation. Patterns of xylem development: xylem in brown; arrows show direction of development from protoxylem to metaxylem. In his book De plantis libri XVI (On Plants, in 16 books) (1583), the Italian physician and botanist Andrea Cesalpino proposed that plants draw water from soil not by magnetism (ut magnes ferrum trahit, as magnetic iron attracts) nor by suction (vacuum), but by absorption, as occurs in the case of linen, sponges, or powders. The Italian biologist Marcello Malpighi was the first person to describe and illustrate xylem vessels, which he did in his book Anatome plantarum … (1675). [note 1] Although Malpighi believed that xylem contained only air, the British physician and botanist Nehemiah Grew, who was Malpighi's contemporary, believed that sap ascended both through the bark and through the xylem. However, according to Grew, capillary action in the xylem would raise the sap by only a few inches; in order to raise the sap to the top of a tree, Grew proposed that the parenchymal cells become turgid and thereby not only squeeze the sap in the tracheids but force some sap from the parenchyma into the tracheids. In 1727, English clergyman and botanist Stephen Hales showed that transpiration by a plant's leaves causes water to move through its xylem. [note 2] By 1891, the Polish-German botanist Eduard Strasburger had shown that the transport of water in plants did not require the xylem cells to be alive. Wikimedia Commons has media related to Xylem. ^ Purcell, Adam. "Xylem and phloem". Basic Biology. Archived from the original on 2016-05-04. ^ Keith Roberts, ed. (2007). Handbook of Plant Science. 1 (illustrated ed.). John Wiley & Sons. p. 185. ISBN 9780470057230. ^ Richard B. Mancke (1977). Providing for Energy: Report of the Twentieth Century Fund Task Force on United States Energy Policy (illustrated ed.). Tata McGraw-Hill Education. p. 42. ISBN 9780070656178. ^ Raven, Peter A.; Evert, Ray F. & Eichhorn, Susan E. (1999). Biology of Plants. W.H. Freeman and Company. pp. 576–577. ISBN 978-1-57259-611-5. ^ McCulloh, Katherine A.; John S. Sperry; Frederick R. Adler (2003). "Water transport in plants obeys Murray's law". Nature. 421 (6926): 939–942. Bibcode:2003Natur.421..939M. doi:10.1038/nature01444. PMID 12607000. ^ Dickison, W.C. (2000). Integrative Plant Anatomy (page 196). Elsevier Science. ISBN 9780080508917. Archived from the original on 2017-11-06. ^ Koch, George W.; Sillett, Stephen C.; Jennings, Gregory M.; Davis, Stephen D. (2004). "The limits to tree height". Nature. 428 (6985): 851–854. Bibcode:2004Natur.428..851K. doi:10.1038/nature02417. PMID 15103376. ^ Knoblauch, Michael; Knoblauch, Jan; Mullendore, Daniel L.; Savage, Jessica A.; Babst, Benjamin A.; Beecher, Sierra D.; Dodgen, Adam C.; Jensen, Kaare H.; Holbrook, N. Michele (2016-06-02). "Testing the Münch hypothesis of long distance phloem transport in plants". eLife. 5: e15341. doi:10.7554/eLife.15341. ISSN 2050-084X. PMC 4946904. PMID 27253062. ^ Tim J. Tibbetts; Frank W. Ewers (2000). "Root pressure and specific conductivity in temperate lianas: exotic Celastrus orbiculatus (Celastraceae) vs. Native Vitis riparia (Vitaceae)". American Journal of Botany. 87 (9): 1272–78. doi:10.2307/2656720. JSTOR 2656720. PMID 10991898. Archived from the original on 2007-10-12. ^ Cruiziat, Pierre and Richter, Hanno. Plant Physiology Archived 2008-12-28 at the Wayback Machine. Sinauer Associates. ^ Dixon, Henry H.; Joly, J. (1894). "On the ascent of sap". Annals of Botany. 8: 468–470. ^ Dixon, Henry H.; Joly, J. (1895). "On the ascent of sap". Philosophical Transactions of the Royal Society of London, Series B. 186: 563–576. ^ Tyree, M.T. (1997). "The Cohesion-Tension theory of sap ascent: current controversies". Journal of Experimental Botany. 48 (10): 1753–1765. doi:10.1093/jxb/48.10.1753. Archived from the original on 2015-02-20. ^ Wang, Z.; Chang, C.-C.; Hong, S.-J. ; Sheng, Y.-J. ; Tsao, H.-K. (2012). "Capillary Rise in a Microchannel of Arbitrary Shape and Wettability: Hysteresis Loop". Langmuir. 28 (49): 16917–16926. doi:10.1021/la3036242. PMID 23171321. ^ Askenasy, E. (1895). "Ueber das Saftsteigen" [On the ascent of sap]. Botanisches Centralblatt (in German). 62: 237–238. ^ Askenasy, E. (1895). "Ueber das Saftsteigen" [On the ascent of sap]. Verhandlungen des Naturhistorisch-medizinischen Vereins zu Heidelberg (Proceedings of the Natural History-Medical Society at Heidelberg). 2nd series (in German). 5: 325–345. ^ Dixon, H (1914). Transpiration and the ascent of sap in plants. London, England, UK: Macmillan and Co.
^ Campbell, Neil (2002). Biology. San Francisco, CA: Pearson Education, Inc. p. 759. ISBN 978-0-8053-6624-2. ^ Carlquist, S.; E.L. Schneider (2002). "The tracheid–vessel element transition in angiosperms involves multiple independent features: cladistic consequences". American Journal of Botany. 89 (2): 185–195. doi:10.3732/ajb.89.2.185. PMID 21669726. ^ a b c d e f g h i j k l m n o p q r s t u v w x y z aa ab ac ad ae af Sperry, J. S. (2003). "Evolution of Water Transport and Xylem Structure". International Journal of Plant Sciences. 164 (3): S115–S127. doi:10.1086/368398. JSTOR 3691719. ^ a b c d e f g h Niklas, K. J. (1985). "The Evolution of Tracheid Diameter in Early Vascular Plants and Its Implications on the Hydraulic Conductance of the Primary Xylem Strand". Evolution. 39 (5): 1110–1122. doi:10.2307/2408738. JSTOR 2408738. PMID 28561493. ^ Koratkar, Sanjay (2016-02-24). "Cavitation and Embolism in Vascular Plants (With Diagram)". Biology Discussion. ^ a b c d Foster, A.S.; Gifford, E.M. (1974). Comparative Morphology of Vascular Plants (2nd ed.). San Francisco: W.H. Freeman. pp. 55–56. ISBN 978-0-7167-0712-7. ^ Taylor, T.N. ; Taylor, E.L.; Krings, M. (2009). Paleobotany, the Biology and Evolution of Fossil Plants (2nd ed.). Amsterdam; Boston: Academic Press. pp. 207ff., 212ff. ISBN 978-0-12-373972-8. ^ White, A. Toby; Kazlev, M. Alan. "Glossary". palaeos.com. Archived from the original on December 20, 2010. Bellorini, Cristina (2016). The World of Plants in Renaissance Tuscany: Medicine and Botany. Abingdon-on-Thames, England: Routledge. p. 72. ISBN 9781317011491. Kramer, Paul J.; Boyer, John S. (1995). Water Relations of Plants and Soils. London, England: Elsevier Science. p. 2. ISBN 9780080924113. Malpighi, Marcello (1675). Anatome Plantarum … (in Latin). London, England, UK: Royal Society of London. p. 8. Jansen, Steven; Schenk, H. Jochen (2015). "On the ascent of sap in the presence of bubbles". American Journal of Botany. 102 (10): 1561–1563. doi:10.3732/ajb.1500305. PMID 26400778. Lazenby, Elizabeth Mary (1995) "The Historia Plantarum Generalis of John Ray: Book I – a translation and commentary. ", doctoral thesis, University of Newcastle upon Tyne, England, UK, vol. 1, p. 160. Available at: University of Newcastle upon Tyne, UK. ^ Grew, Nehemiah (1682). The Anatomy of Plants …. London, England: W. Rawlins. pp. 124–125. From pp. 124–125: "For the great part of the year, it [i.e., the sap] riseth in the Barque [i.e., bark], sc. in the inner Margin adjacent to the Wood, and in the spring, in or through the Wood it self, and there only." (Grew, 1682), p. 126. Grew recognized the limits of capillary action (from p. 126): " … small Glass-Pipes [i.e., capillary tubes] immersed in Water, will give it [i.e., the water] an ascent for some inches; yet there is a certain period, according to the bore of the Pipe, beyond which it will not rise." Grew proposed the following mechanism for the ascent of sap in plants (from p. 126): "But the Bladders [i.e., parenchymal cells] DP, which surround it [i.e., the column of tracheids], being swelled up and turgid with Sap, do hereby press upon it; and so not only a little contract its bore, but also transfuse or strain some Portion of their Sap thereinto: by both which means, the Sap will be forced to rise higher therein." Arber, Agnes (1913). "Nehemiah Grew 1641–1712". In Oliver, Francis Wall. Makers of British Botany: A Collection of Biographies by Living Botanists. Cambridge, England: Cambridge University Press. p. 58. ^ Hales, Stephen (1727). Vegetable Staticks: Or, an account of some statical experiments on the sap in vegetables: …. London, England: W. & J. Innys and T. Woodward. p. 100. ISBN 9780356030128. Strasburger, Eduard (1891). Histologische Beiträge [Histological Contributions] (in German). vol. 3: Ueber den Bau und die Verrichtungen der Leitungsbahnen in den Pflanzen [On the structure and the function of vascular bundles in plants]. Jena, Germany: Gustav Fischer. pp. 607–625: Aufsteigen giftiger Flüssigkeiten bis zu bedeutender Höhe in der Pflanze [Ascent of poisonous liquids to considerable heights in plants], pp. 645–671: Die Leitungsfähigkeit getödteter Pflanzentheile [The ability of the killed parts of plants to conduct [water]]. (Jansen & Schenck, 2015), p. 1561. Muhammad, A.F. ; R. Sattler (1982). "Vessel Structure of Gnetum and the Origin of Angiosperms". American Journal of Botany. 69 (6): 1004–21. doi:10.2307/2442898. JSTOR 2442898. ^ Hales explained that although capillary action might help raise water within the xylem, transpiration caused water to actually move through the xylem. From (Hales, 1727), p. 100: "And by the same [capillary] principle it is, that we see in the preceding Experiments plants imbibe moisture so vigorously up their fine capillary vessels; which moisture, as it is carried off in perspiration [i.e., transpiration], (by the action of warmth), thereby gives the sap vessels liberty to be almost continually attracting fresh supplies, which they could not do, if they were fully saturate with moisture: For without perspiration the sap must necessarily stagnate, not withstanding the sap vessels are so curiously adapted by their exceeding fineness, to raise the sap to great heights, in reciprocal proportion to their very minute diameters."